A New York State Supreme Court judge ordered Twitter to hand over the account information of Occupy Wall Street protester Malcolm Harris, Bloomberg reports. Twitter has until September 15 to comply with the court order to face an undisclosed fine proportionate to its last two quarterly earnings statements. Since the ruling was originally made on June 30, Twitter has already had more than two months to comply with the state court's subpoena. Twitter appealed the decision and requested to have punitive action delayed until its appeal can be processed; however, that request was denied last week. Harris' lawyer called the quashing of Twitter's appeal "outrageous". Given the massive scale and real-time nature of Twitter, the company insists that its users own their own data. At the very least, that much is spelled out in its terms of service agreement. As such, Twitter contends the onus of legal compliance and privacy rights fall squarely upon its users: not the company. Unfortunately for Twitter, their reasoning doesn't jibe with the judge. 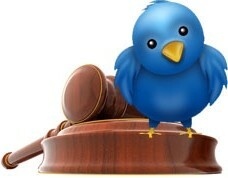 The court ruling indicates that Twitter is responsible for producing tweets, not its users. However, it is unclear how this point is relevant since the court admits the tweets in question have already been publicly disseminated. In practical terms, it appears the court hopes to link about 3.5 months' worth of tweets from @destructuremal to Harris. Although the account claims to be "Malcolm Harris", Twitter's help is necessary in order to identify the true account owner. Of course, the account holder's information is not made publicly available and therein lies the crux.